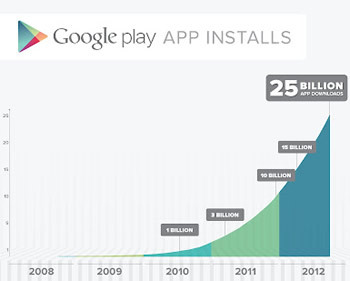 Google announced today that Google Play (formerly the Android Market) has reached 25 billion downloads and counting. To celebrate this milestone, the company is now offering select apps for a quarter -- yes, a mere 25 cents -- over the next five days. Incidentally, Apple's own App Store reached 25 billion downloads in March. Although we don't have a complete list of apps expected to make the bargain list, Google promises us that they are from top developers such us Gameloft, Rovio, runtastic, Full Fat and Electronic Arts. Thus far, Angry Birds Space Premium, Office Suite Pro 6, runtastic PRO, Asphalt 7 and Symphony of Eternity are just some of the titles being offered. You can view today's full list here. In addition to promotional apps, Google will also be offering discounts on certain 25-themed collections, like 25 movies you must own, 25 banned books, 25 albums that changed the world and Google Play's 25 top selling magazines. Currently, Google Play lays claim to more than 675,000 apps -- a number which is more than doubling every year. That's roughly about the same number as the iOS App Store, according to the latest figures from Apple CEO Tim Cook. Other app markets, like those of Windows Phone and Blackberry, lag far behind Google and Apple in terms of selection. Interestingly, Google threw a very similar sale nearly a year ago after reaching 10 billion downloads. Instead of 25 cents though, apps were being offered for just 10 cents.